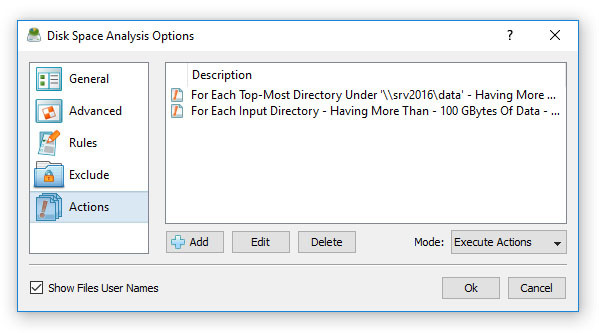 One of the most powerful capabilities of DiskSavvy Server is the ability to evaluate disk space analysis results and send E-Mail notifications and/or automatically generate reports for each disk or directory matching user-specified rules and conditions. For example, the user is provided with the ability to send E-Mail notifications and/or generate reports when too much data or too many files are detected in a disk or directory. In order to add one or more disk space analysis actions, open the disk space analysis command dialog, press the 'Options' button, select the 'Actions' tab and press the 'Add Action' button. 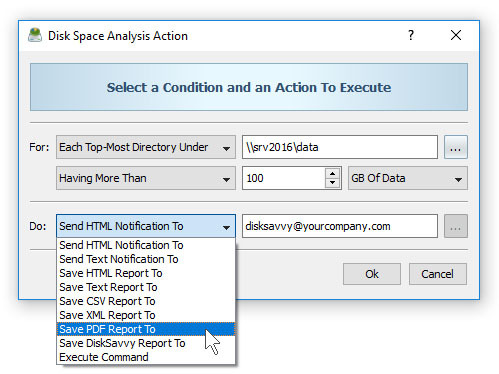 On the disk space analysis action dialog, specify a condition that should trigger the action and an operation to perform when the condition is met. Conditional disk space analysis actions are designed to be used with periodic disk space analysis operations allowing one to automatically perform disk space analysis operations, evaluate disk space analysis results and send E-Mail notifications and/or save reports if disk space analysis results for one or more disks, directories or network shares match user-specified rules and policies. Conditional disk space analysis actions may be especially useful in conjunction with file matching rules allowing one to analyze specific types of files or file categories and send notifications and/or generate reports informing about abnormal or undesired patterns in disk space usage. For example, the user may define file matching rules specifying to analyze all types of images with the file size larger that X MB that were not accessed during the last Y months and send an E-Mail notification and/or generate a report for each directory containing a user-specified number of such files.